There comes a time for any developing nation when graft stops facilitating modernization, and makes its leaders look plain illegitimate. Malaysians want good governance, and are educated enough to see when the economy is mismanaged and when the state is just not doing its job. Except for news connected to the tragic incidents involving MH370 and MH17, Malaysia doesn’t often make the headlines of major Western newspapers. This observation underscores just how hard Malaysian Prime Minister Najib Razak was hit by the Wall Street Journal (WSJ) when the paper decided to provide extensive coverage of the 1MDB scandal. Though corruption in Southeast Asia is not news, the scope and scale of this particular case should make us wonder if it is time to start thinking about it differently. In case you missed it, here is the gist. 1Malaysia Development Berhad (1MDB) is a state investment fund established back in 2009. Under the Razak-led advisory board it was supposed to turn Kuala Lumpur into a financial hub and foster economic development in Malaysia. 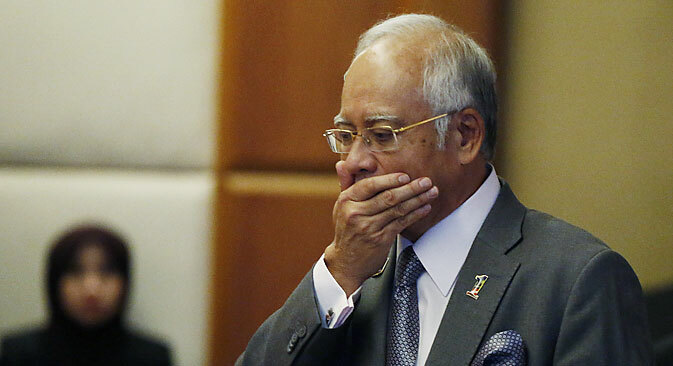 It turned out, however, that 1MDB owes about $11 billion and is missing debt payments. When events started to unravel, WSJ claimed that it had papers indicating that about $700 million of the funds ended up in the Prime Minister’s personal accounts. Najib Razak denies all accusations, and in a recent move decided to sack his deputy Muhyiddin Yassin, who was critical of the leader’s handling of the situation, as well as Attorney General Abdul Gani Patail, who led the investigation into the scandal. Corruption is often named as one of the most serious social issues for developing countries in Asia. It is so omnipresent, that scholars have been using the only possible explanation: it’s natural. It is not ‘good’ from a moral standpoint, of course, but is often seen as gear oil for rapid economic modernization that many countries of the region have been going through for the last several decades. To put it simply: Officials in developing countries tend to support those projects from which they can benefit personally. But at a certain point in time the damage from corruption starts to overpower its benefits for the economy and, no less importantly, for society. The process of producing, distributing and consuming goods becomes more and more detached from the daily involvement of government officials. Even if the amount of actual money that officials steal stays the same, the broader population, as well as influencers from other factions, parties, media and businesses, are not that eager to tolerate such behavior anymore. Over time, wealth that is not stolen becomes gradually distributed among the rest of the population, giving it confidence to not tolerate outright embezzlement or nepotism. We still don't know what actually happened with 1MDB and we should not make any prior conclusions about the Malaysian leader's guilt. But the fact that Razak fired several top government officials at once over the whole situation will clearly have a negative effect on the way the country is managed and on its attractiveness to foreign investors and partners. Even more upsetting is the fact that new details about the scope and scale of corruption in Malaysia were discovered via news from Australia, where companies were willing to pay for favorable business conditions in Southeast Asian countries including but not limited to Malaysia and Vietnam. It seems as though these businesses see emerging Asia as their own Wild West, where they can just buy officials for profit. As gruesome as the issue of transnational corruption may seem, we are still missing a piece of the puzzle. Where are the people in all of this? The 1MDB scandal has caused significant outrage in Malaysian social media in the form of sarcastic posts and photoshopped pictures. This may seem harmless but it demonstrates serious loss of trust towards the government on behalf of the most active part of the population. For a middle-income country like Malaysia, growth is not enough anymore. The people want to see good governance, and are educated enough to see when the economy is mismanaged and when the state is just not doing its job. When a coalition rules a country for over 50 years, people start to question its legitimacy through the political process. Hence, Malaysia has the Bersih movement (Coalition for Clean and Fair Elections). There is another way though. ‘Legitimacy through success’ has proved to be very efficient in maintaining leadership for certain groups, including the communist parties in China and Vietnam. But this only works if success is evident and if the parties are capable of keeping themselves in good shape, eradicating ineffective policies and ineffective managers. So this is essentially the question for the Malaysian elites. Will they be able to prove their ability to adapt and prolong economic success for the country? Or will they crack under pressure? Regardless of whether the allegations against Najib Razak are true, clearly something went wrong with 1MDB, and Malaysians know it. They can’t trust their own government if it can’t right its own wrongs. Anton Tsvetov is the Media and Government Relations Manager at the Russian International Affairs Council (RIAC). He tweets on Asian affairs and Russian foreign policy at @antsvetov. The views expressed here are the author’s own and do not reflect those of RIAC or RBTH.